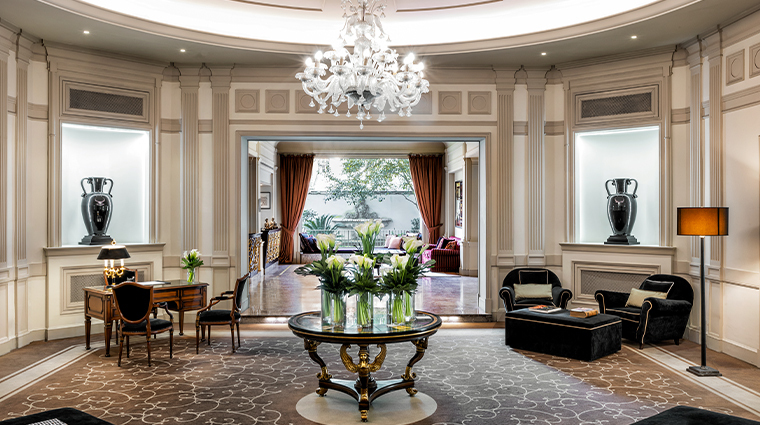 An elegant and understated 19th-century hotel in a leafy area of the city center, porta al prato, Sina Villa Medici, Autograph Collection is close enough to the action of Florence without being overrun with tourist groups. It is conveniently located near the central train station Santa Maria Novella, but still has an appealing just-out-of-the-way location. Often the stopping point for football clubs (Juventus and Rome), plenty of movie and music royalty have also stayed here, including the much-loved Roberto Benigni and Luciano Pavarotti. A walk into the sumptuous baroque lobby, perfumed with Acqua del Elba, is an exercise in luxury. Fun touches like freestanding statues of dogs lend pops of quirk to a serious lobby that is adorned with gilded mirrors and important statues (replicas from the Bargello Museum and surrounding galleries). While it certainly is historic, the hotel has hard-to-find Florence perks, such as a lovely outdoor swimming pool and a gym. Spa services, two restaurants and a bar round out the modern offerings. The onsite pool (rare in central Florence) is an homage to another era, with statues dotting the verdant outside garden. The friendly concierge is there for any last-minute tips, advice or to arrange specific tours — a private boat on the Arno River, perhaps? The top-of-the-line guest room is the 1,399-square-foot, Imperial-style Royal Suite. It features a majestic salon protected by the Italian Ministry of Cultural Heritage, plus high ceilings, a king bed, a living room with fireplace and a Botticino marble bathroom. If you dine at the Conservatory, don’t miss the famous bistecca alla fiorentina (Florentine steak). The plush fitness center is equipped with modern machines, three treadmills, weights, a Turkish bath and sauna. There is an ample meeting room space that can also be converted to accommodate private dinners. 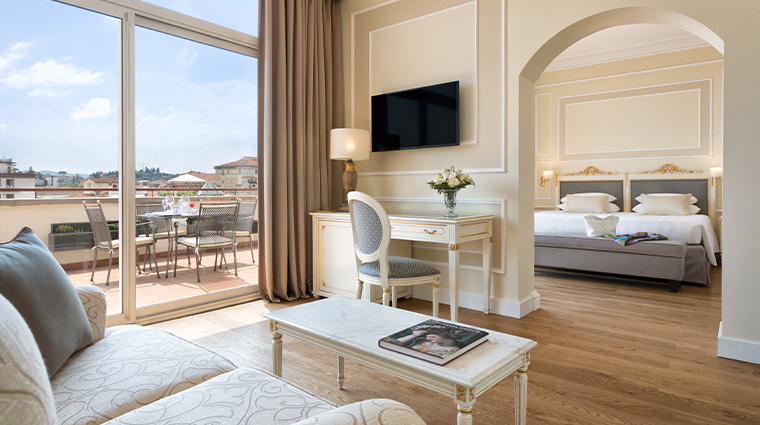 The Florence hotel has a total of 100 rooms and suites furnished in either contemporary décor or more classic elegance. Suites have two bathrooms (as do some deluxe rooms) and all rooms feature Carrara marble bathtubs and showers. Many of the suites also have terraces overlooking the pool area or the city. The six Penthouse Deluxe rooms on the top floor all feature panoramic balconies. Meals are taken in the beautiful Conservatory, overlooking the pool and garden area, which serves as a relaxing oasis from Florence’s hustle and bustle. The Conservatory menu is naturally Mediterranean, featuring classic Italian dishes such a tagliatelle with black truffles and toasted almonds. Creative influences surface in the kitchen with dishes like a goose carpaccio with shaved fennel marinated in lime. Everything can be paired with vinos from a strong wine list, and champagne to boot. The Jockey Bar is elegantly outfitted with options for a light lunch, sandwiches or snacks outside of regular mealtimes. Order from the cocktail list featuring local favorites like a Negroni cocktail, which is native to Florence.